Group portrait of the First Tramway Contingent of New South Wales, taken at Sydney showgrounds. The men were from the following depots; Waverly, Ocean Street, Rozelle, Newtown, Manly, Tempe, North Sydney, Enfield, Newcastle, Dowling street, Fort Macquarie and Ultimo. 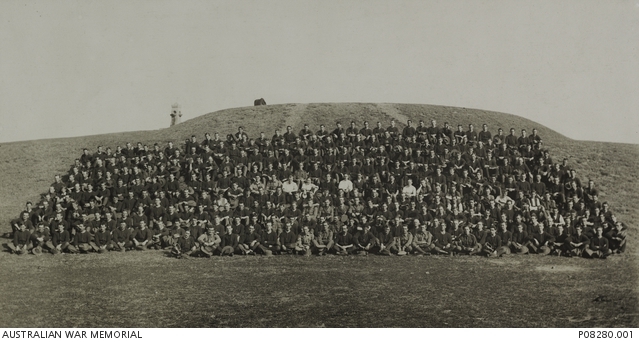 Known to be in the image is 3454 Sergeant (Sgt) Peter Balmain, 17th Battalion. Sgt Balmain was awared a Military Medal in September 1918 for “daring and intiative” and for being “a tower of strength” during the attack on Mont St Quentin.